On the surface, Riverview High School looks like the post-racial ideal. Serving an enviably affluent, diverse, and liberal district, the school is well-funded, its teachers are well-trained, and many of its students are high achieving. Yet Riverview has not escaped the same unrelenting question that plagues schools throughout America: why is it that even when all of the circumstances seem right, black and Latino students continue to lag behind their peers? Through five years' worth of interviews and data-gathering at Riverview, John Diamond and Amanda Lewis have created a rich and disturbing portrait of the achievement gap that persists more than fifty years after the formal dismantling of segregation. As students progress from elementary school to middle school to high school, their level of academic achievement increasingly tracks along racial lines, with white and Asian students maintaining higher GPAs and standardized testing scores, taking more advanced classes, and attaining better college admission results than their black and Latino counterparts. Most research to date has focused on the role of poverty, family stability, and other external influences in explaining poor performance at school, especially in urban contexts. Diamond and Lewis instead situate their research in a suburban school, and look at what factors within the school itself could be causing the disparity. 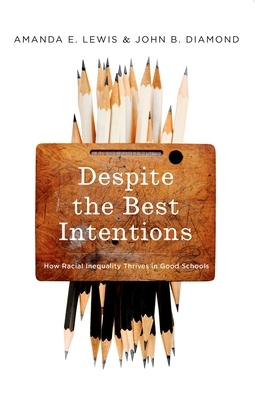 Most crucially, they challenge many common explanations of the 'racial achievement gap, ' exploring what race actually means in this situation, and why it matters. An in-depth study with far-reaching consequences, Despite the Best Intentions revolutionizes our understanding of both the knotty problem of academic disparities and the larger question of the color line in American society. Amanda Lewis studies racial dynamics in the contemporary US. Her research focuses on how race shapes educational opportunities and on how our ideas about race get negotiated in everyday life. She is the author of the award-winning Race in the Schoolyard: Negotiating the color-line in classrooms and communities along with several other volumes. She is on the faculty in the Departments of Sociology and African American Studies at the University of Illinois at Chicago. John Diamond is a sociologist of education who focuses on how race, ethnicity, and social class intersect with school leadership, practices, and policies to shape educational opportunities and outcomes. He is the Hoefs-Bascom Professor of Education at University of Wisconsin-Madison School of Education. Previously, he was an associate professor of education at the Harvard Graduate School of Education and past research director for a consortium of U.S. schools that used research to address racial achievement disparities.